In the old days, if a citizen felt like they were in danger, the standard advice was to call the cops. As a result, there are a ton of people applying for concealed carry permits. 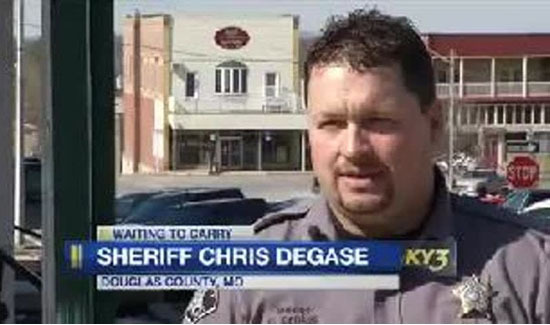 “We’ve seen about three times the amount as last year,” Douglas County, Missouri Sheriff Chris Degase recently told reporters regarding permit applications. Degase says people are worried about terrorists and car theft. “We had the recent incident in Buffalo with ISIS, we had an incident here where people were buying cell phones… it seems like after that happened, when they were here trying to buy bulk cell phones, there was a big influx of people wanting to take the CCW class,” Degase said. While people are waiting for their permits, the sheriff advises them to brush up on the law. “Now with the new Castle Doctrine of 2007, it’s a stand your ground law, so you are under no obligation to retreat, you are under no obligation to run back into your home, and if you were confronted in your yard and you feared for your life and safety, then of course you are justified in using lethal force,” Degase said. Degase says people think if someone is stealing your car out of your driveway that they can just go out and shoot them. But in order to be on the right side of the law, it’s critical that people say they feared for their life after the shots are fired. Also, the sheriff says, the Castle Doctrine doesn’t apply to residences. It means you don’t have to retreat anytime or anywhere.